TPS Xiaomi Tool is the useful tool for MI account remove. This tool also works on Bypass all Mi cloud, Mi account, and all Xiaomi devices very easily and softly within few seconds. This latest tool works on almost all Android mobile devices. With the help of this tool, you can easily flash, Bypass your device Frp lock within few clicks. This tool also allows you to check the device information, remove the screen lock, reboot the device, unlock the MI bootloader with a single click only. just follow our steps and instructions carefully for use TPS MI account unlock tool. Remove MI account VIA EDL mode. Remove MI account VIA fast boot mode. Screen lock removes sideload mode. This latest Xiaomi tool allows you to find the test point on Xiaomi Qualcomm device, Simply select the test point tab Xiaomi and then select the model number and you will be able to see the test point of the respective device on your computer screen, many more options added in this latest Tool. If you wish to use this latest tool, then click the given link for free download. Once download file is complete. Then simply Run the file setup for install. So download and install this tool for PC. 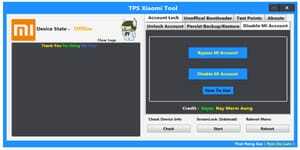 TPS Xiaomi Tool latest version is available free download directly from our website. If you are interested in downloading the latest TPS Xiaomi Tool. Then simply follow the given download link given at the of this post. This tool is free and very easy to use. So just click and download this latest TPS Xiaomi Tool for your PC.